ENTER CODE appears on the display when the power is reconnected. 1. Turn on the audio system. 2. Enter the audio security code using the preset buttons. If you enter an incorrect digit, continue to the last digit, then try again. If you do not enter the code correctly after 10 tries, you need to visit a dealer to have the system reset. Find the audio system’s security code and serial number on the radio code card. Do not store the card in your vehicle. If you lose the radio code card, you must obtain the information from a dealer. To use the audio system function, the ignition switch must be in ACCESSORY (q or ON . 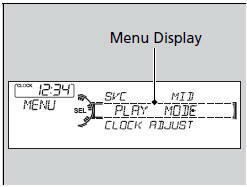 MENU button: Press to select any setting such as the clock, sound control, or the compass. Press this button again to cancel the menu display mode. 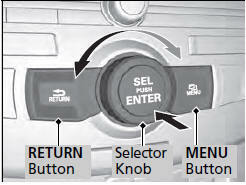 RETURN button: Press to go back to the previous display.